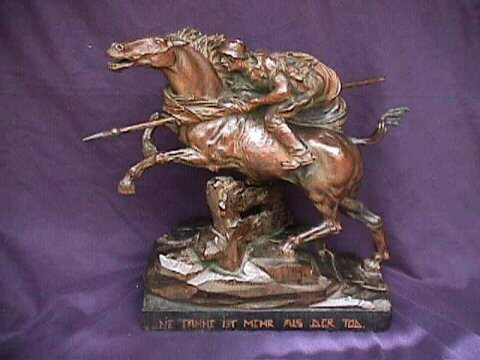 DESCRIPTION: This is a magnificent sculpture in wood of a German cavalryman in the familiar theme of Der Geist der Deutschen Soldaten, "The Spirit of the German soldier." 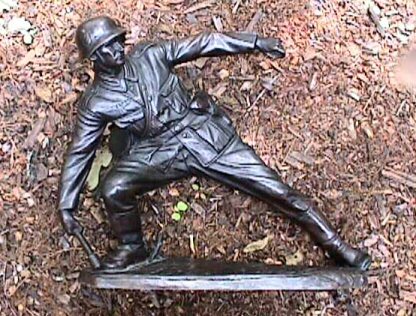 It is a heroic figure fantastically carved of a German WWII soldier mounted and in the attack formation with flagpole brought forward and at the ready. The missing flag from the pole is folded and cradled all about his body. 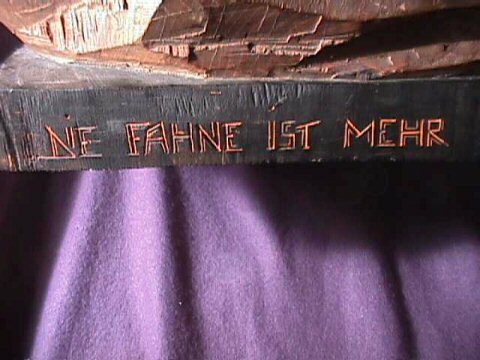 The reason for this is brought forward with the inscription on the base. The man is almost ghostlike. The mount is almost a spirit also. The sculpture is one of the finest and most intricate that we have had the pleasure to see, let alone acquire. The inscription at the front base seems to say the flag means more than our death. 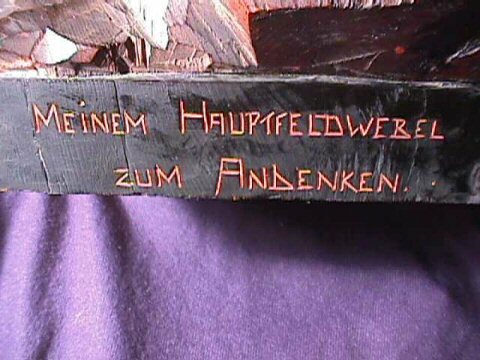 It is remarkably unsigned and it is a presentation to a company officer (Hauptfeldweber) in memory of his leadership. The officer's name is Ig. 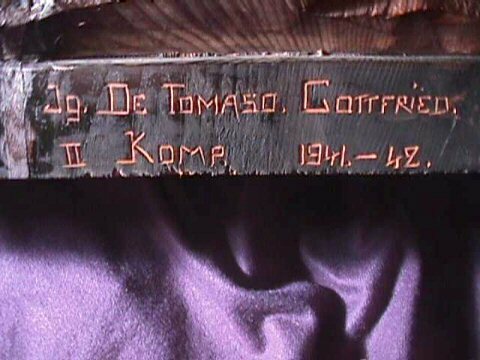 de Gottfried Tomaso and was presented by the Second Company which he commanded from 1941-1942. This is fine enough to have been included in various German Third Reich art books, although we haven't located it at this point in time. 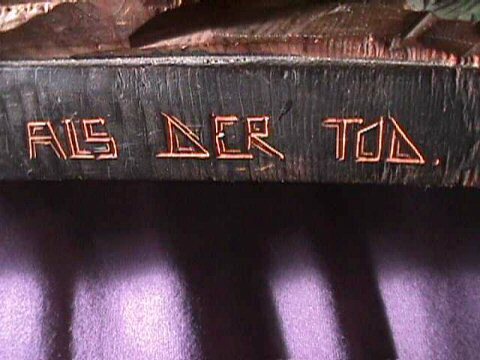 The carver definitely belonged to the dramatist school of sculpture. This is great!!! It measures 17 inches nose to tail, 18 inches high, 14 ½ inches across the base. Wonderful central piece for a WWII collection. DESCRIPTION: Tailor-made, soft moleskin material. The diamond in brittle plastic material is intact. 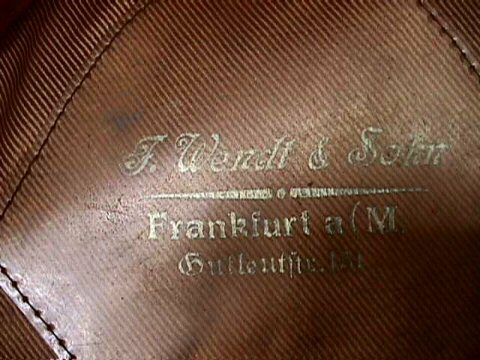 The cap was made or sold by F. Wenell & Sohn in Frankfurt A (main) Gutlevf Str. 131. Small size. 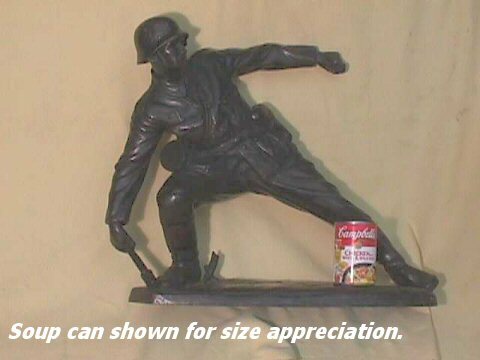 Please do not ask for size. All we can do is measure inner circumference. The bullion eagle, wreath, and roundel are in very nice condition overall. The silver bullion cap cord is also fine. Brim is uncracked. 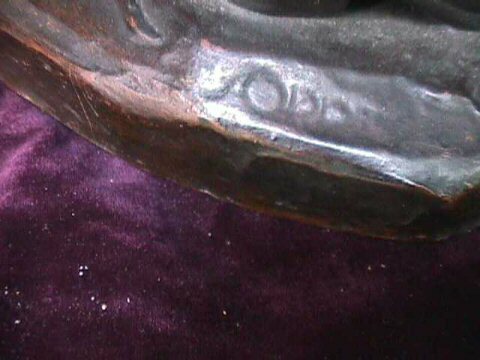 The bullion is hand sewn on and the threads show up clearly inside. 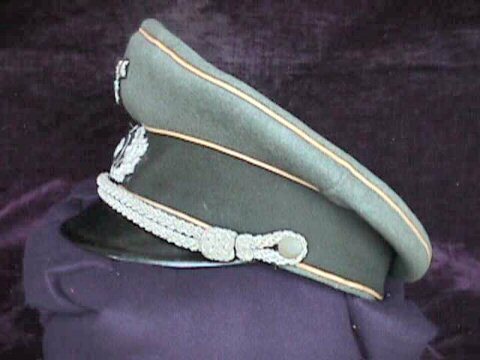 White piping for infantry. 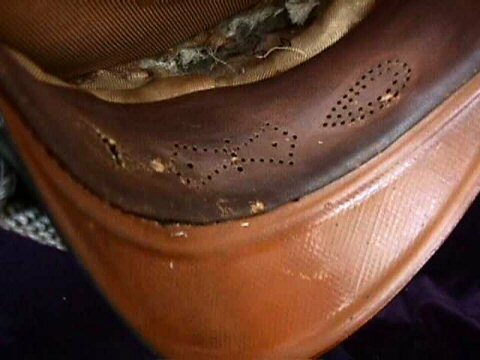 Nice, honest wear and no abuse. DESCRIPTION: This is nothing short of magnificent. 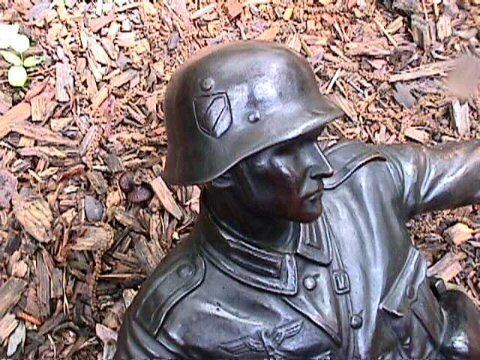 It is a bronze sculpture of a Wehrmacht soldier in combat. 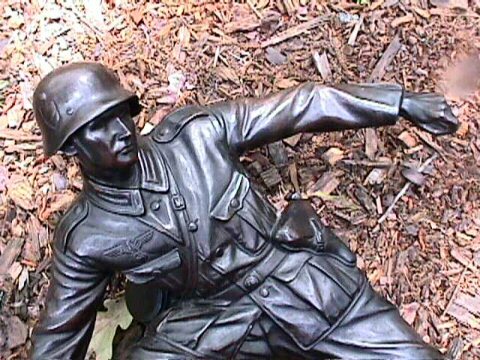 He is depicted in the act of throwing a potato-masher grenade. This is a LARGE sculpture measuring 20 inches across the base and 17 inches high. 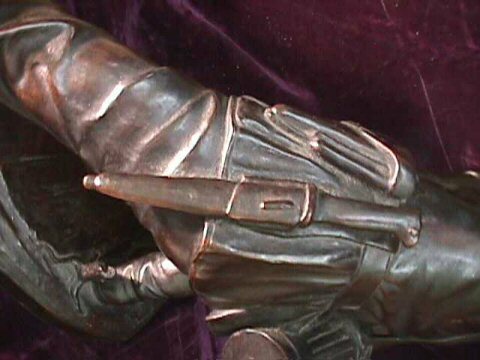 The distance from the hand holding the grenade to the extended hand is 19 inches. 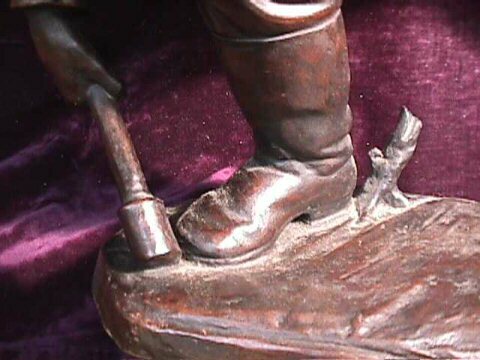 The distance from boot tip to boot tip is 18 ½ inches. The width across the base is about 7 inches. This sculpture is BIG. This is a familiar figure often portrayed in smaller sizes and in porcelain as well. 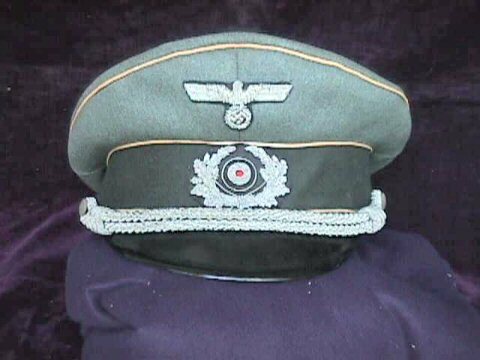 The name is Der Geist der Deutschen Soldaten, "The Spirit of the German Soldiers." It was designed by an artist know only as 'Spof.' (See signature photo.) The detail is nothing short of fantastic. 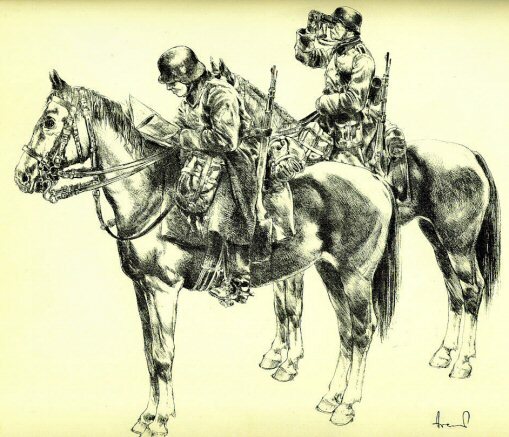 The Luger holster, bayonet, gas mask canister, are magnificently depicted. There may be some artistic license in the detail of the helmet decal, but this is to be expected. 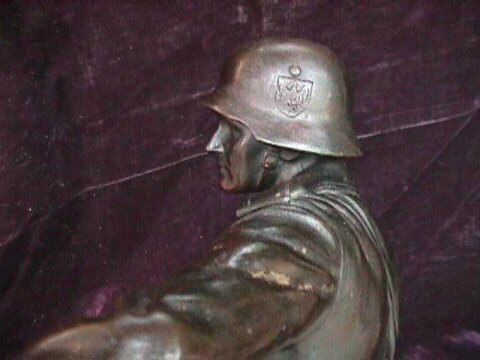 All in all this is a true and fine representative piece depicting the "Defenders of the Fatherland." 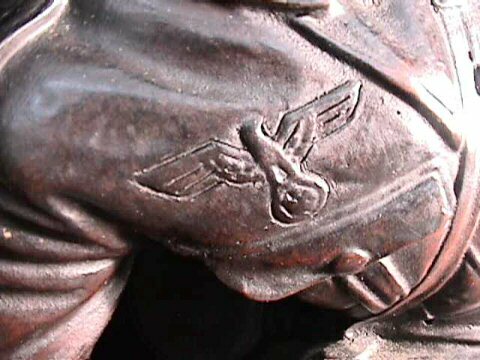 It is really an action sculpture yet approaches the epitome of National Socialist art. 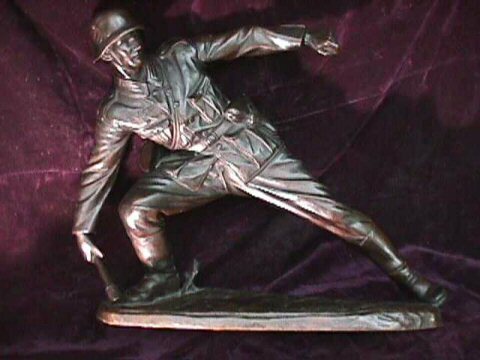 These bronze sculptures were seen in headquarters of various infantry regiments and would grace the foyers of the showplace barracks of the elite regiments. 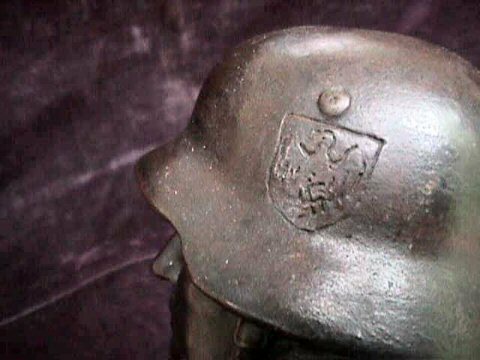 They are sometimes still found in Germany, but the average GI did not stuff something this heavy in his duffel bag to bring home to the US no matter how beautiful. We offer this one for a very competitive price because when sold we have a chance to purchase another out of a Hamburg collection. They don't come much more dramatic than this one! 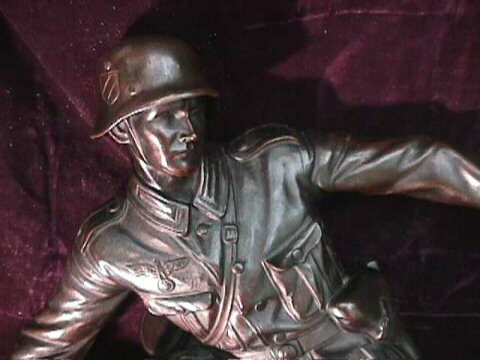 PRICE: SOLD; (but), recently we have been offered another one of these magnificent statues by a collector in Germany. If you are interested in acquiring one, please contact us!